FODMAPs are a collection of molecules found in foods, that can cause issues for some people. A low-FODMAP lifestyle is the only diet recommended by the NHS to treat IBS and its associated symptoms. Emma Hatcher, creator of the blog She Can't Eat What? !, brings you 100 beautiful, healthy and delicious low FODMAP recipes. Emma's book, based on her hugely popular food and lifestyle blog She Can't Eat What?! will take the frustration out of living with IBS, Crohn's disease, coeliac's disease, food intolerances and many other digestive disorders. It is for anyone who suffers from bloating, tummy pains, digestive issues or feelings of heaviness and discomfort, and for anyone who wants to feel healthy and happy after eating. 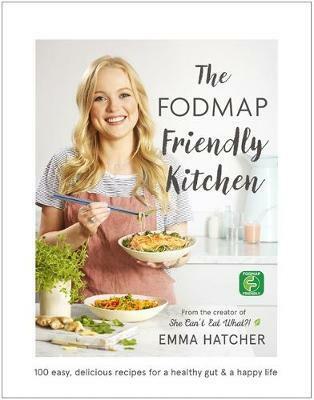 Backed by the official FODMAP Friendly team and with more than 100 quick, easy and modern recipes, diet information and personal stories for those that have run out of answers and feel 'they can't eat anything', Emma shows you how to create delicious meals and look after your gut in today's stress-filled, modern lifestyle. Emma Hatcher is an unashamed health foodie who has suffered from a sensitive gut for as long as she can remember. After years of horrible symptoms and endless frustration she came across the Low FODMAP Diet and has never looked back. Determined to share her story and help others in the same position, she set up her hugely popular food and lifestyle blog (www.shecanteatwhat.com). Full of stress-free ways to cook for sensitive digestive systems and food intolerances that are both healthy and delicious, Emma shows us just how easy, nutritious and life-changing a low FODMAP diet can be.